I designed my page in such a way that it follows mostly the same format as the existing wiki page about the M24, so that it could be easily inserted. In other words, this is designed as a major expansion to the existing M24 wiki page. The M24, due to its significant lack of Armour but high mobility, has a very different and far more engaging play style than most heavy or medium tanks. Due to its great lack of Armour, it should never remain in one place for more than one or two shots, as it will risk being detected, which will usually lead to its destruction. Instead, it should constantly change position in order to avoid detection and sneak up on the enemies’ flanks and rear. Due to its high mobility and good gun, the M24 is an ideal tank for flanking. There are two different ways of flanking, outlined below. When flanking in this manner, knocking out an enemy tank with your first shot is important, since you will have the element of surprise. If your first shot does not kill the enemy tank, or at least its ability to move, the enemy tank will be able to angle itself in order to reduce your chances of landing another good shot. Therefore aiming carefully is very important. Try to hit an ammo rack to immediately kill the tank, or its engine to prevent it from angling itself. After you killed an enemy tank, take cover again and change your location to avoid being detected by other tanks. This tactic is ideal on maps dominated by short-range combat, such as city maps and mountainous maps. This type of flanking is usually done after you have detected an enemy close to you. For example, you might be moving along a road inside the village on the Poland map, and spot an enemy tank down the road, hiding behind a building. In order to flank him, move to a parallel road, and drive down all the way to the enemy tank. Assuming that this enemy has not changed location, you will now be able to shoot at his side or rear armor. *On city maps, you can move from house to house, making sure there are buildings at your sides whenever you stop. 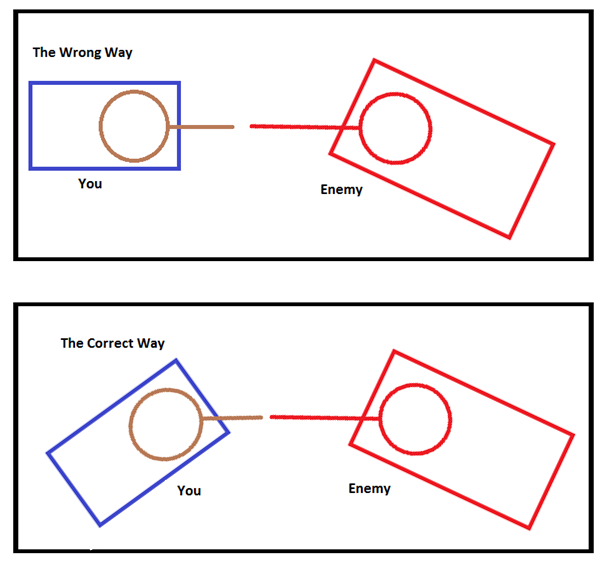 This way, it is very unlikely that an enemy will be able to take a shot at your side. Whenever you advance, make sure that the road ahead is clear. You should also watch out for your teammates- if they are in a parallel street, or they are next to you, they can protect your flank, and you can protect theirs. *On country maps, try to stay in dips or valleys rather than moving on top of mountains, unless a rock or something similar can provide you cover at the top. This is because when you are at a high point, you will be able to see all of your enemies, but you will also be exposed to them from all sides. So always try to stay behind rocks, or inside a dip or shell hole. Although the M24 should generally avoid shootouts with enemy tanks, and instead use its mobility to its advantage, there are some cases where it may have to directly oppose an enemy tank. In these scenarios, it is important to properly angle the tank to minimize the risk of Armour penetration and increase the probability of a ricochet. 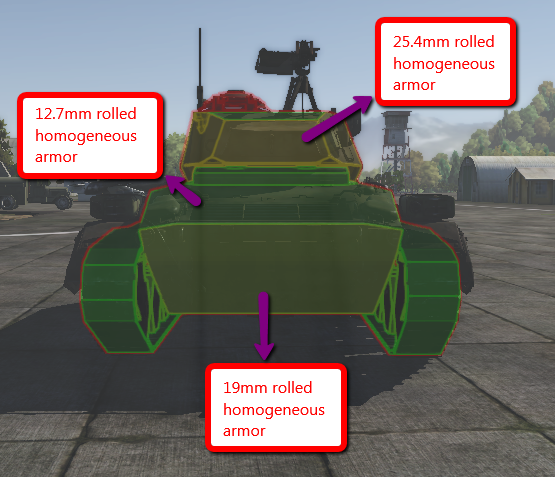 The illustrations below are designed to give you an idea of how to angle your tank to achieve maximum effective Armour thickness while also being able to defend yourself. When you are partially covered by an object, such as a rock or house, it is important to use a tactic called “Sidescraping” to reduce the risk of an enemy shot penetrating your Armour. The illustrations below show how to correctly sidescrape. In War Thunder, the M24 is an American light tank found at rank III in the US Army Tech Tree. It has a battle rating of 3.7 in Arcade, Realistic and Simulator Battles. 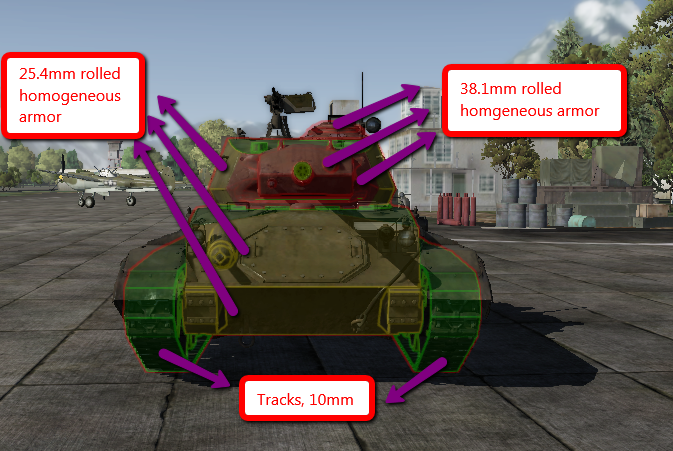 Below you can find detailed information about the M24 in War Thunder as well as its data sheet. The M24 requires 18,000 Research Points to unlock, has a purchase price of 77,000 Silver Lions, and a crew training cost of 22,000 Silver Lions. The 75mm cannon of the M24 is a very capable gun. However, it is important to remember that the M24 has only 48 rounds of ammunition so do not waste it. More about ammunition in the next section. *If you have not yet unlocked the M61 APCBC ammunition, the best thing to do is to pack lots of M72 shots and a few M48 High explosive shells. 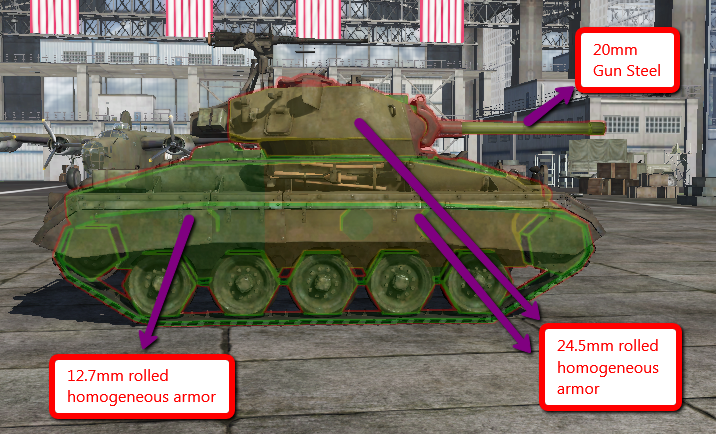 Since you are less likely to need the M48 shells, 8-10 will usually be enough, leaving you with the ability to load 38-40 M72 Armour-Piercing shells. You should use the M72 shells against most enemies, and leave the M48 shells only for attacking lightly Armoured vehicles. *Once you unlock the M61 APCBC shell, it is a good idea to bring lots of these shells into battle, since the M61 is truly the most adaptable shell with the widest variety of uses. 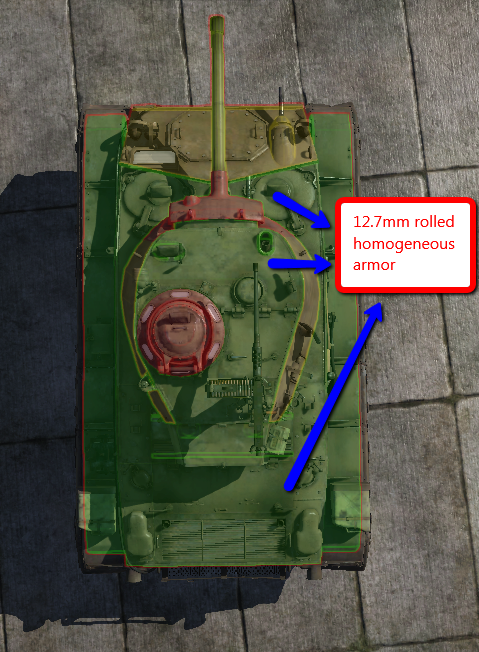 The M61 shell is able to penetrate the Armour of most enemies you will be facing, except for some of the heavily Armoured tanks, such as the KV-1. Taking about 25 M61 shells into any given battle is a good idea, as it is a very versatile shell. This leaves you with 23 more shells to be distributed: a good ratio would be 8 M48 and 15 M72 shells. As you can see, the M24 has all of the standard upgrades improving its mobility, turret drive and elevation, and of course parts as well as fire extinguishers. 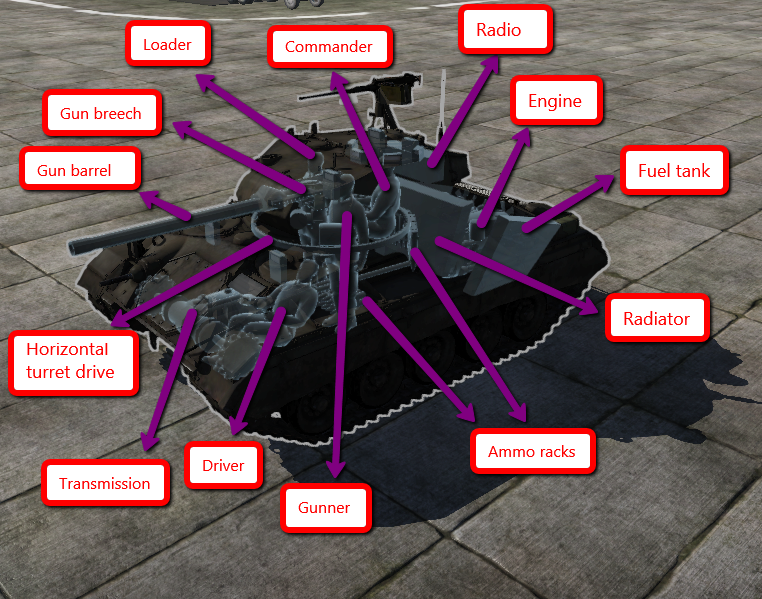 Since the M24 is a light tank, it also has the ability to unlock the “Artillery Support” upgrade. If you want to purchase a Backup vehicle for the M24, the cost is 20 Golden eagles, and a Talisman will cost you 980 Golden eagles to purchase. A non-upgraded (stock) M24 has a maximum repair cost of 1450 Silver Lions, the fully upgraded version can cost up to 1876 Silver Lions to repair.